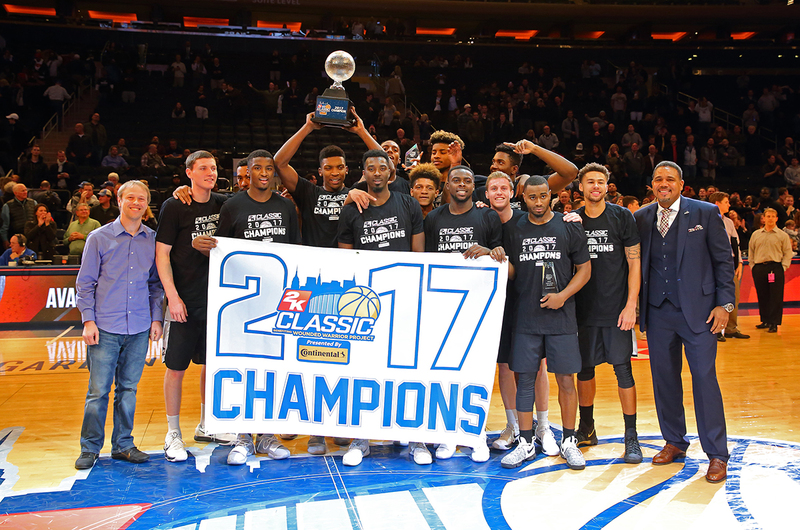 NEW YORK, N.Y. – A hot offense and a stifling defense propelled Providence to the 2017 2K Classic benefiting Wounded Warrior Project championship with a 90-63 win over Saint Louis at Madison Square Garden. The Friars shot 31-50 (.620) from the field, including an amazing 9-of-10 (.900) from 3-point range while holding the Billikens to 19-of-55 (.345) shooting and 6-of-22 (.273) from behind the arc. Balanced scoring was the hallmark for Providence in its two wins at The Garden. Rodney Bullock led the Friars this evening with 15 points while Alpha Diallo, Makai Ashton-Langford and Maliek White each scored 11 points. Kyron Cartwright, who was named the tournament’s Most Valuable Player, had nine points and eight assists on the night. Bullock joined Cartwright on the all-tournament team. Javon Bess, who also earned all-tournament honors, led the Billikens with 16 points. Davell Roby also reached double digits with 14 points. In the consolation game, Virginia Tech rebounded from its loss to Saint Louis the night before with a resounding 103-79 win over Washington. As a team, the Hokies shot 30-of-50 (.600) from the field and 15-of-22 (.682) from three in reaching 100 points for the second time in three 2K Classic games. Justin Bibbs led all scorers with 30 points and Ahmed Hill netted 23 in earning a place on the all-tournament team. Kerry Blackshear Jr. netted 20 points and Justin Robinson added 11 points. Washington was led by Jaylen Nowell and his 21 points. Nowell was also named to the all-tournament squad. Naziah Carter added 12 points.